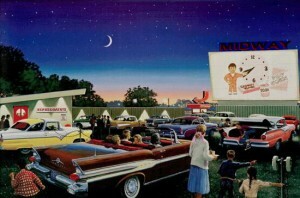 Drive-in movie theaters are an imporant part of Americana. While drive-in movie theaters are an important part of American cultural lore, reaching their heyday in the 1950s and 1960s, they have not received sufficient attention of late. It is almost as though people have forgotten that they exist. 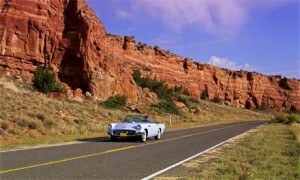 However, drive-in theaters continue to show the latest films in many area throughout the United States. Unfortunately, it can often be hard to find a good listing of drive-in movie theaters. If you don’t have a movie theater near you, you might want to find one on vacation. Alternatively, you might simply want a different type of night out. City newspapers rarely carry information about drive-ins, and there are no state-wide directories for finding them. That is what this site provides. It is a comprehensive list of every drive-in movie theater in the United States of America – hundreds of them. We provide a name of the theater, a photograph if one is available, a map and a link to their website where a list of current films is usually available. By using our website, you can quickly find a drive-in theater near you. Please see the links on the right to find movie theaters according to your state. Please note that Alaska has no drive-in theaters, since it is too cold in the winter and too bright in the summer for them to function. Why Go To Drive-In Theaters? Drive-in theaters bring together two of the great joys of modern life: cars and movies. In a standard movie theater, we lose our sense of having our own space. Instead, we are placed in a giant room with a group of hundreds of other people and need to squeeze between narrow rows to get to our seats, hoping not to drop our concession products on the way. In a car, we control the space. We can lean back in our own chairs and adjust them as we see fit. We don’t need to worry about the people behind us talking or answering their cell phones during the climax of the movie. If we need to go to the washroom, we don’t need to push our way past a dozen different people. The space is ours. Why, then, don’t we just watch the movie at home? After all, that is our own space (and it’s cheaper). This is where the other great love of the last century becomes important: the car. The car is a source both of adventure and freedom. The unnatural speed coupled with direct control provides us with a rush that few inventions ever have (except perhaps the horse, but that’s not exactly an invention).